About 10-15 years ago, there was a common pattern among shows like Smallville, Battlestar Galactica and Heroes, in which the show would open with a dramatic teaser, roll credits, and then start with a subtitle of “24 Hours ago…” or some other moment that would start us off on our journey to the opening teaser. I feel that’s a big ol’ cheat. If a writer has to use the conclusion to hook his audience, then he’s not really making an effort (Yes, Mark Verheiden, I’m looking in your direction). So, that’s how Harley Quinn #60 opens. But within the flashback, there’s another flashback even further. “Artsy,” they calls it. NO, not really. Perhaps Sam Humphries should watch the movie Passage to Marseille (1944), starring Humphrey Bogart. Then he might see how a UN-artsy a flashback within a flashback truly is. 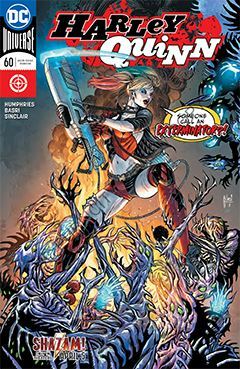 Basically, the story is another in a series of trials from the Lords of Order and Chaos, to determine Harley’s worthiness of a grand reward. But at this point, it’s hard for me to care. She’s too “human” to ever warrant such a cosmic reward, in my opinion. Like much of DC’s output these days, the emphasis seems to be on spectacle, an immense canvas of cosmic events that would shake the universe. But it’s been going on so long, it’s hard to discern the highs from lows, mainly because the only lows that exists are in the cinematic DCU, with all it’s grim and grit. DC seems to be trying to turn that around, but the fact is there is no “magic formula” to meet the needs/wants of the audience. If they truly want to climb to the top, they should do it one good story at a time.